HomeMy Work Data Analysis Do you want a faster internet experience? Are you a power-user, try out namebench. It hunts down the fastest DNS servers available for your computer to use. 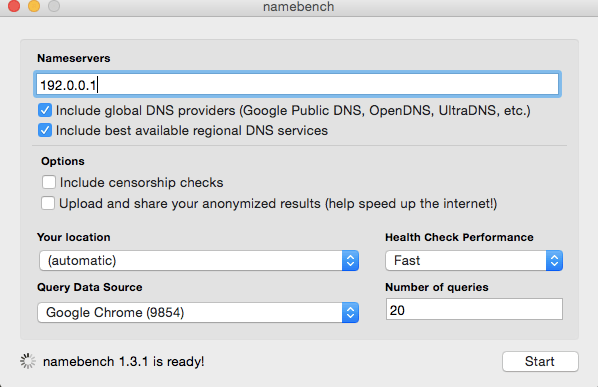 namebench runs a fair and thorough benchmark using your web browser history, tcpdump output, or standardized datasets in order to provide an individualized recommendation. namebench is completely free and does not modify your system in any way. Download the app for you operating system windows or OSx – launch program and start the scan. After the scan is over you will receive a overview with a suggestion to which DNS you can add your laptop to to get better speed.